Hi everyone, it’s Terra from Mama Says Sew! 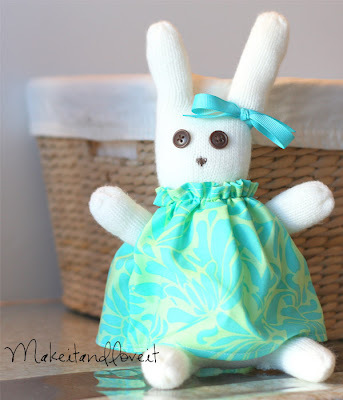 I made this Easy Bunny Purse Tutorial, which makes a great Easter accessory for any little girl! It’s pretty quick to put together, and you can easily make your own pattern, so you can make it just the right size. I added a little face and ears, but you could easily customize it to make it into a different animal. Smaller triangle ears and a different shaped nose would make a cute kitty purse for a little girl who loves kitties! This bunny purse is the perfect accessory for any Easter dress! You can also adjust the strap length as needed. I made my straps longer, so it would go across my daughter’s body, but you could do a shorter strap for a shoulder bag, or even two short straps for a cute little handbag! First, cut two circles out of your main fabric for the purse body. You can trace a bowl that is the right size, or make your own circle pattern. Cut two circles from interfacing if using. Note: if you are going to use interfacing, go ahead and baste/iron it to each piece of fabric you cut, then just treat them as a single piece of fabric. I added interfacing to every piece except the strap. Now find the circumference of your circle. Fold your circle into fourths and measure one straight side. The circumference is that number (the radius) x 2 x 3.14. Keep that number in mind. Now it’s time to insert the zipper. Cut two lengths of fabric the same length as your zipper. The total width should be how wide you want your purse to be, plus seam allowances. With right sides together, sew your zipper tape to one of the pieces of fabric from the last step. I find it helpful to stop about halfway through with the needle in the fabric and unzip the zipper past where your needle is, so that you don’t have to sew past the zipper. Repeat with the other piece of fabric and the other side of the zipper. Press the fabric flat and topstitch on either side of the zipper. This is what you should have now. Set aside. Cut a piece for the strap and fold it in half, wrong sides together. Unfold, then fold the raw edges in to the center and press. Fold it back in half, and stitch close to the open folded edge. Baste the strap to the zipper pieces on both ends, making sure your strap doesn’t twist. Remember your circumference number? You’ll need it now. Measure the zipper and subtract that number from your circumference, plus another inch (for seam allowances of 1/2 inch on each end). The answer is the length you will need to cut for the rest of the side of the purse, plus another inch (again for seam allowances). It should be the same width as the zipper piece. With right sides together, sew the zipper piece to the piece from the last step at each end, creating a circle. Set it aside. Mark the center of one of your circles. This will be the face for the bunny purse. Add a nose, then trace some lines on the face for whiskers. I just sewed along the traced lines with black thread with my machine, then sewed the felt nose on the top. And here is the little felt nose. Also sew the button eyes on at this point. Now create the ears. I just drew a pattern free hand. Make sure to add a piece at the bottom for a seam allowance. Cut two ears from the main fabric and two from the contrast fabric. Sew the ears right sides together and trim the seam allowance. Baste the ears onto the face of your bunny purse. With right sides together, pin the face of the bunny purse to one edge of the zipper circle. Sew, making sure to not catch the ends or sides of the ears or the strap in the seam. Repeat for the other circle for the back of the purse. Incidentally, wouldn’t a little pom pom tail on the back be cute? I just thought of that, and I think I’d like to add one to mine! And it’s finished! Enjoy your new bunny purse! Isn’t it cute? My original plan was to make one without eyes, but my daughter protested. She said it looked weird. Whatever, haha! Simple CIRCLE PURSE Tutorial...for Girls! « Wall Mounted Mail Organizer…from scrap wood! Love this! Can’t wait to make this for my little girls! Thanks for sharing. Thanks! I hope they love it!